The Signalink USB turned out to be a disappointment for several reasons but the main one was that the noise floor was almost 20dB higher than an ordinary $10 Creative desktop sound card. I had assessed that noise filtering in the Signalink USB was inadequate and contacted Tigertronics who would neither help with a fix nor supply a schematic to help in finding a fix. QST recently carried a modification which does improve the noise floor, in my case by 10dB. 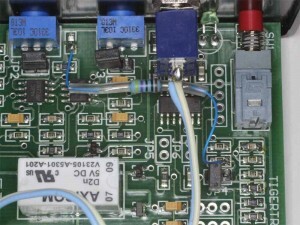 The modification involves supplying the bias to some op-amps from a regulated supply rather than direct from the USB supply. Above, the 470Ω resistor with long pigtails connects the output of the 3.7V regulator to the bias filter, a resistor from the USB supply to that point having been removed (at the left hand resistor connection). 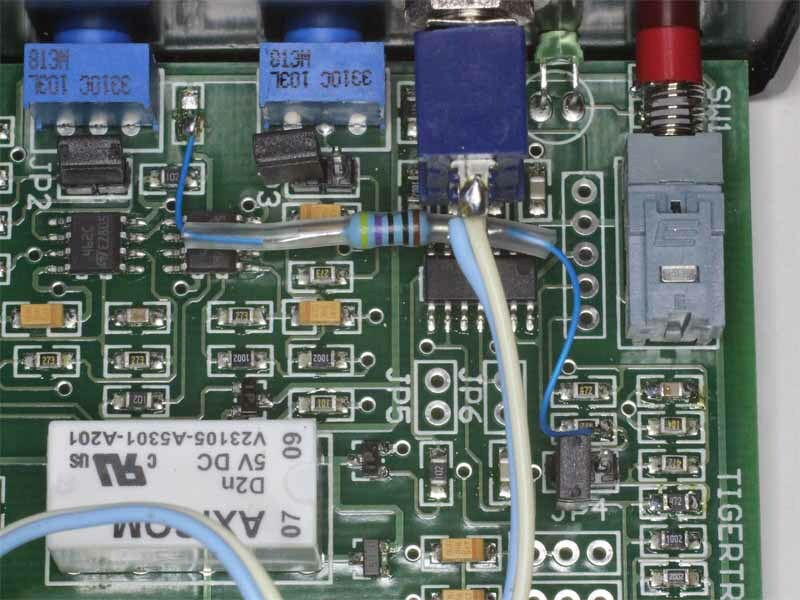 The resistor should be fixed in place with a small dob of hot melt adhesive. The modification reduced the noise floor from -71dBfs to -81dBfs, and although it is still high compared to a $10 creative sound card at -89dBfs, it is a very worthwhile improvement. (Measurements were made using the SCZ button of NFM, and they represent power averaged over 5s relative to full scale. The switch with blue and white wires is another mod to disable PTT so that the thing does not key up a transmitter when being used in rx mode… another oversight of the original design (Signalink USB PTT disable).